Allan Goodman is the rare musician who is talented on multiple instruments and possesses the type of distinct singing voice that makes you stop and pay attention. Goodman is a southern California native who followed his muse to Texas. He has carved out a name for himself as a standout sideman and go-to musician’s musician in the Texas musical mecca of New Braunfels. 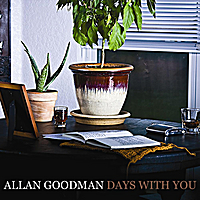 Now, Goodman is stepping to the forefront as he releases his new album, Days With You. It is a an album squarely at home in the Americana genre and it finds his Neil Diamond meets Hal Ketchum voice wrapping its charm around his personalized lyrics and charming melodies. It is apparent upon listening that Goodman’s travels and relationships have helped to shape an album full of desolate tales both geographic and emotional in nature. The isolation in the lyrics is matched with the warmth of the music. Goodman’s got a unique ear and pen and is not afraid to showcase his vulnerability via tracks such as “Wish The Rain” and “Falling”. On the flip side of that, he’s not above flexing some musical muscle on tracks like “25 to Life” and “Time For a Change”. This is one of those records that sneaks up on you because at first listen you may disregard it, but a while later you find yourself humming one of the melodies and reaching to replay that one tune. That one song turns into three more and so on until you can’t get this collection of songs out of your regular listening rotation. Goodman has crafted a journey that is personal, heartfelt and genuine…something that is not always easily found in any genre of modern music. I just want to say I’m new to weblog and absolutely loved this web-site. Almost certainly I’m likely to bookmark your blog . You actually come with very good writings. Many thanks for sharing your web-site. You completed a few fine points there. I did a search on the subject matter and found nearly all people will consent with your blog. I’ve been browsing on-line greater than three hours today, yet I never found any fascinating article like yours. It¡¦s lovely value sufficient for me. In my view, if all site owners and bloggers made good content material as you did, the net will probably be much more helpful than ever before. I¡¦m now not certain the place you are getting your info, however good topic. I must spend some time finding out much more or figuring out more. Thanks for magnificent information I used to be searching for this information for my mission. I do believe all the ideas you’ve offered on your post. They are very convincing and can certainly work. Nonetheless, the posts are very quick for beginners. Could you please prolong them a little from subsequent time? Thanks for the post.